This chandelier has hung in the Small Senate Rotunda since 1965. Imported from Europe in 1903, it previously hung in a historic Baltimore theater and a Capitol Hill church. Originally smaller, it has been enlarged and modified over its history. The chandelier hanging in the Small Senate Rotunda of the U.S. Capitol has attracted attention ever since it was installed in 1965. It was purchased for $1,500 from the ABC Wrecking Co., which had removed it from the Capitol Hill United Methodist Church on Seward Square in southeast Washington, D.C., before razing that building. Although its manufacturer is not known, the chandelier was imported from Europe in 1903 for the grand Maryland Theater in Baltimore. Over the years this theater was the scene of vaudeville, film and live dramatic presentations. When the theater was being razed in 1951, a parishioner purchased the chandelier for Trinity Methodist Church (later renamed the Capitol Hill United Methodist Church). The chandelier was smaller then: it consisted of the six-foot bronze ring, which was ornamented in relief and coarse filigree; a smaller ring that formed the main basket; and a large crystal ball attached to the basket, which terminated the chandelier. The pastor added eight glass arms, hurricane lamps, a brass crown, and Czechoslovakian crystal chains leading to the crown, thus making the fixture eight feet wide and eleven feet high. 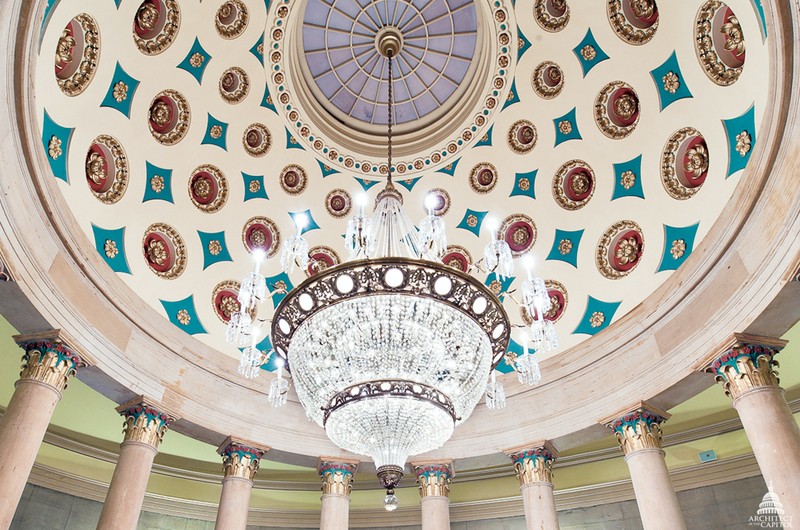 When it was acquired by the Architect of the Capitol, the chandelier was rewired and lamp sockets were replaced. The eight fragile glass arms on the main ring were replaced with 16 short bronze arms. Each arm terminates in a glass bobeche with a circle of pendent crystal prisms. The chandelier is estimated to have 14,500 crystals and weighs nearly 2,000 pounds. It is suspended from an electrically driven winch on a steel cable, which allows it to be lowered for cleaning.